The Hamster Plus™ is SecuGen's® 500 DPI optical fingerprint reader. The Hamster Plus has a built in Auto-On feature that can be enabled from software applications like the Spectrum TimeClock BioNetick™ module. With Auto-On enabled, the laser light in the fingerprint reader is left turned off until the reader senses the presence of a finger over the clear fingerprint touchpad. The SecuGen Hamster Plus uses a highly accurate fingerprint reader sensor. In an independant test of major biometric products, carried out by the International Biometric Group, SecuGen's sensor and algorithm achieved a 0.0% false acceptance rate (FAR) and a 0.0% false rejection rate (FRR). Its innovative optic design yields an image that is practically without distortion, and that has high contrast. SecuGen's patented SEIR method eliminates the majority of image quality problems that are common to traditional optical sensors. Ergonomic design makes it easy to use with any finger or thumb. Hardend fingerprint contact area is scratch, impact, corrosion and electrostatic discharge resistant. Auto-On feature automatically detects finger and turns on laser light. The SecuGen Hamster Plus connects to your computer via a USB connection. 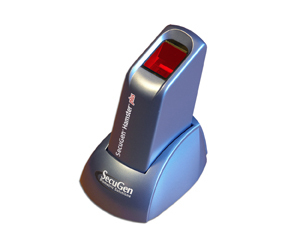 Buy the SecuGen Hamster Plus Fingerprint Reader for $79.00. Internet Orders are accepted via the "Add to Cart" button at right. Orders ship via US Priority Mail, a 2 to 3 business day service offered by the US Postal service. Available only in the USA. Tennessee residents pay 9.25% sales tax. SecuGen, Hamster Plus, and FDU03 are trademarks or registered tardemarks of SecuGen Corporation in the USA and other countries. SecuGen is a member of the BioAPI Consortium and supports the BioAPI BSP version 1.1 through their SDK Collection. If you're looking for a more powerful way to track employee time and attendance, take a look at Spectrum TimeClock, our web based employee timeclock software and service. Click the button below Now!